Canadian Space Agency 2018-19 Departmental Plan. Credit: SpaceQ/CSA. The Canadian Space Agency (CSA) today published its departmental plan for the current budget year 2018-19, and while it is slightly higher at $349 million than last years planned spending for this year, it is a continuation of a downward budgetary spiral. The graph below, provided by the CSA, shows a six year spending trend that is obviously not going in the direction the space community expected. And considering what many other leading space nations are spending, and what emerging nations are planning on spending, it is perplexing. Somewhere the government lost sight that the space sector provides a positive economic multiplier. 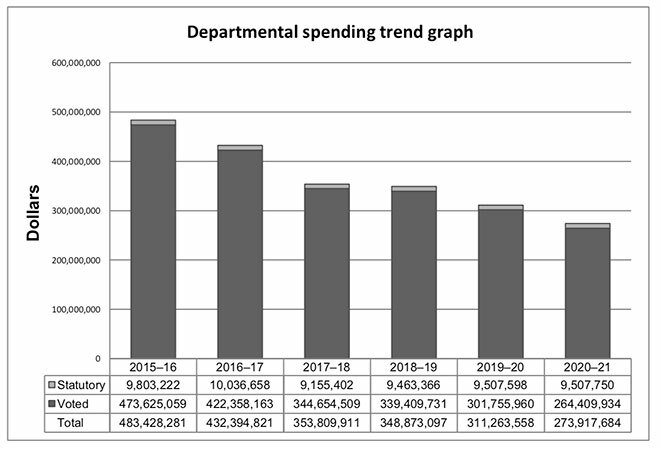 It should also be noted that what the graph doesn’t show, but which is outlined in the report, is that actual expenditures for 2015-16 and 2016-17 were lower than what was expected to be spent. In 2015-16, the spend was to have been $483 million but was $412 million. In 2016-17 the spend was to have been $432 million but was $388 million. Part of the downward trend can be attributed to reduction in spending on the RADARSAT Constellation Mission program which is set to launch this fall. The build phase of the program is complete. With no new significant programs announced, it’s no surprise the budget is going lower. Update: The Treasury Board website the following additional information for this years budget. Approximately $348.9 million in total funding is anticipated through the Main Estimates ($339.4 million in voted appropriations and $9.5 million in statutory). With this funding, the Canadian Space Agency (CSA) will continue to design, direct, manage and implement programs and projects related to scientific and industrial research and development activities in space. Overall (voted and statutory), Canadian Space Agency’s total authorities for 2018–19 have a net decrease of $4.9 million from the previous year’s total Main Estimates. Increasing of $8.8 million related to the International Space Station (ISS); Increasing of $2.6 million for Surface Water & Ocean Topography (SWOT-C) project; Decreasing of $7.5 million for items in Budget 2016 related to safety increase at John H. Chapman space center as well as the purchase and installation of absorber material for the David Florida Laboratory (DFL) Bay 2 Anechoic Chamber; Decreasing of $5.0 million according to the 2015 Budget for the Contribution Program under the Canada-European Space Agency Cooperation Agreement for the Advanced Research in Telecommunications Systems (ARTES) program; and Decreasing of $4.4 million due to funding received in 2017-18 for the Canadian Space Agency’s David Florida Laboratory (DFL) infrastructure and corresponding equipment to maintain its space capabilities and improve compliance with applicable building codes and standards. CSA 2018-19 Main Estimates and Supplementary Estimates (A, B and C). Credit: Treasury Board of Canada. We would like to provide you in-depth detail that is usually found in the CSA’s Sub and Sub-Sub Programs portion of the Department Plan, but it was not included this year. The government has instituted a new government wide InfoBase website with data on every agency. Unfortunately data for the CSA’s current budget year for Spending by Program is not available. We are reaching out to the Canadian Space Agency to get this data as soon as possible. In the fall of 2018, an Announcement of Opportunity (AO) for the next wave of the Space and Technology Development Program will be launched to invest $10.0M in promising space technologies. At the same time, the CSA’s investment in 32 companies for a value of approximately $20.0M resulting from the 2017–18 AO will support companies in such areas as artificial cognitive systems to support medical diagnostics in long-duration spaceflights and related terrestrial applications, and the improvement of satellites’ downlink capacity using optical systems. The Science, Technology and Expertise Development in Academia (STEDiA) initiative will also invest $3.6M in the Flights and Fieldwork for the Advancement of Science and Technologyxv to support space research in Canadian post-secondary institutions. The CSA will also invest $2.3M in Solar-Terrestrial and Earth System Science and $0.5M in Science and Operational Applications Research in Earth Observation. in 2018–19, through Innovation, Science, and Economic Development Canada’s Innovative Solutions Canadaxxii (ISC) initiative, the CSA will invest $0.3M in small businesses to prove the scientific and technical feasibility, and commercial potential, of a novel idea that addresses a public sector challenge. In 2018–19, the CSA will invest $1.6M in contributions to support Canadian industry in the development of novel applications and services using Earth observation space-based data and information. These innovative applications that seek to integrate data from CSA-supported missions with other massive data sources will help Canadian companies gain competitiveness by tapping into the possibilities offered by big data, cloud computing and machine-to-machine technologies. Combining CSA data such as RADARSAT-1xxiv and RADARSAT-2xvi data with free and open satellite data (Sentinel, Envisat, Landsat), commercial satellite data, in-situ measurements and products like soil maps and weather models, furthers the impact of the CSA’s investments. The current Liberal government has what on paper appears to be a strong innovation agenda but they seem to have forgotten about the space program. The U.S., in a strong bipartisan fashion, is supporting the space program to record spending levels. Think about that statement in context of the current political mess south of the border. If all parties south of the border can agree that spending on the space program is important and will provide economic benefit, why isn’t the government in Canada doing the same? That might be a good question for Question Period and your local member of parliament. Perhaps the government should also listen to Vice President Mike Pence speech today at the 34th Space Symposium. And note, the live stream was sponsored by none other than Maxar Technologies (formerly MacDonald, Dettwiler and Associates Ltd).